Tallahassee youth posed for a picture along with Tallahassee Mayor Andrew Gillum, Florida House Rep. Alan Williams, Mr. FAMU Imir Hall and other contributors to the Tallahassee Gentleman’s Quarterly. Mayor Gillum addressed local youth at the Tallahassee Gentleman’s Quarterly. The Tallahassee Gentlemen’s Quarterly took place Aug. 29 on the campus of Florida A&M University. The Tallahassee Gentlemen’s Quarterly is a male youth conference for high school students in the Tallahassee community. This quarterly conference was started by Florida A&M’s 16th, and the current Mr. Florida Agricultural and Mechanical University, Imir Hall, a public relations student from Miami, Fla.
“This conference is designed to get all of the young black males together throughout the city of Tallahassee and show them that we truly are our brothers’ keeper,” Hall said. 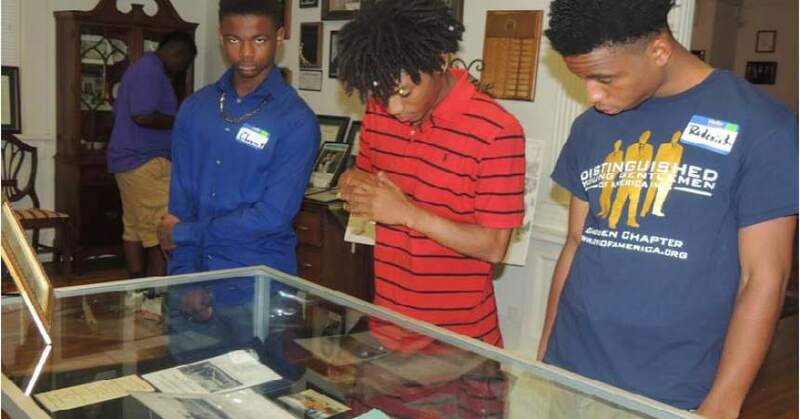 The conference kicked off as students from local high schools split into two groups and attended workshop sessions where they learned about being a black male in America; as well as, the evolution of hip hop music. In the session on being a Black male in America, students learned about having a life mission and reaching their full potential as young men. Also in this session, the young men collectively spoke about their college and career aspirations. Amongst many students was Devonne Childs, a senior at Lincoln High School and the President of the Big Bend Omega Lamplighters. “If you pursue your goals, you can pretty much go wherever you want to in life,” Childs states. Childs wants to pursue a degree in Computer Technology and ultimately work in the field of Video Game Development and Design. Also in attendance were members of Tallahassee’s chapter of the Distinguished Young Gentlemen and Kappa League. The second session that students attended was about the evolution of hip hop music. Students learned about how hip hop was derived as a lyrical art form of expression to provide accounts of the artists’ lives and what took place in their communities on a daily. Johnson goes on to add how the messages through music have changed over time and there have been different circumstances that have resulted from those changes. “We wanted them to, more or less, garner a better understanding of what they’re listening to,” says Johnson. To wrap up the empowering male youth conference was the keynote address made by Tallahassee Mayor Andrew Gillum. Mayor Gillum spoke on how he was once in the same shoes as these students. He said he shared many of the same traits, characteristics and determination to be great one day. He talked about his path of life growing up in Tallahassee and how he ultimately got to where he is today. He went on to add that they can do anything that their heart desires if they put their minds to it. 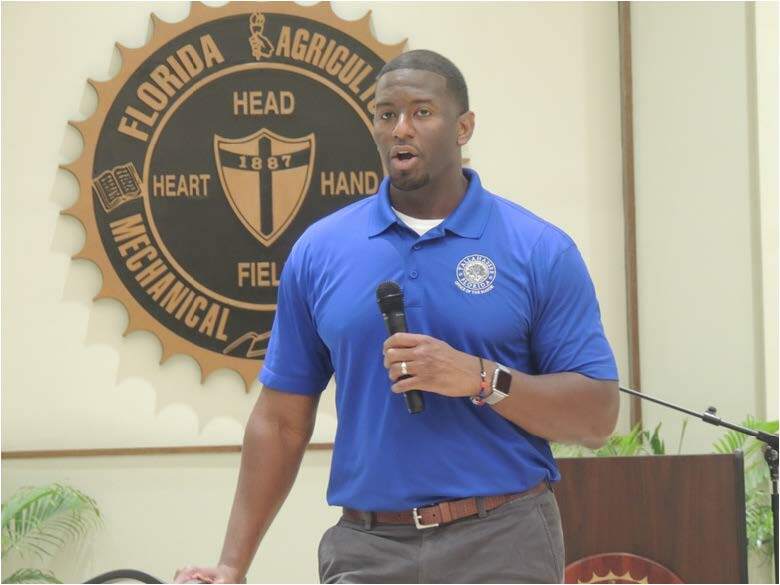 “It never hurts to remind them of their role, their obligation, their responsibility and more importantly the expectations we have for them to do great things,” Gillum said. Also in attendance was Florida House of Rep. Alan Williams, a Tallahassee native. Williams stated how proud he was for an event like this empowering young black males in the community and looks forward to its future successes for years to come. He goes on to commend Imir’s efforts in the community, along with the help of his royal escorts. “There’s light at the end of the tunnel for these gentlemen,” Representative Williams says. The Tallahassee Gentleman’s Quarterly is a conference that Hall will have each semester and wants to keep going strong long after his term as Mr. FAMU.